Wow, its been hot these past few days (3 days in 30 degrees C. range and its a heat wave - lol) and I'm already wanting cooler weather! I recently participated in a swap that called for supplies to be from the new catalogue. I was so pleased to see that Bloomin' Beautiful made it to the main catty as I just love the look of the single flower - so elegant and serene looking, and that is the set I chose to use with new accessories for the swap. This is the card I came up with using Pink Pirouette cardstock and the Bella Rose DSP. I stamped the image on Vellum cardstock and embossed with white EP. I coloured in the flower using my blender pens taking the ink from Pink Pirouette and Kiwi Kiss. When you attach vellum to cardstock you often see the adhesive that's used so I decided to "cover" it up by using the Two Way Glue Pen around the vellum and then dipping it into my container of Dazzling Diamonds. Finished off the card with a bit of the pink taffeta ribbon. When I saw the Monday MakeOver Challenge by Andrea Walford seen here, I thought of all the beautiful colours in the Stampin' Up! colour family and toyed with different colour combinations and ended up with ... yup, black and white. Here is my submission for the challenge. I used the flower from Bloomin' Beautiful (Occasions Mini that ended last month). All supplies are Stampin' Up! I stamped the flower using White Craft and embossed it with White EP. I debated about rolling a background on the large white cardstock but decided that I would just use the piercer to make a design in the corners. I also pierced the smaller piece of white cardstock with a smaller design. I had to touch up a bit of the embossing and the Versamark pen is absolutely perfect for that! On the black strip I punched out the notch using my 1 1/4" square punch so the cut was nice and clean rather than attempting to use my scissors. If I had someone at home when I was making the card, I would have had a picture taken using the punch but unfortunately, only Bella and I are at home - lol. I played around with using several types of ribbon at the top of the circle - from the black and white gingham (too casual), to fraying black and white grosgrain (too messy) to a bow using both white and black grosgrain (too bulky), a white grosgrain bow (um, no and neither just a black grosgrain bow) and decided that it looked just fine without a bow. Time does fly and I feel remiss in not posting sooner than almost two weeks ago but in between we went to Vegas for a few days and when you return from a vacation, it seems like there is so much to catch up on. Finally got a chance to play with my Bloomin' Beautiful set from the Occasions Mini - fell in love with it as soon as I opened the page. 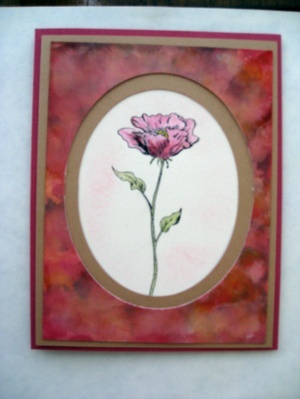 The flowers are beautiful especially the single stem and I made two cards using this stamp. The first one uses the Chalkboard or Pencil Over technique - I actually combined the two techniques. I started out with Basic Black for the base of the card. Stamped the Floral backround stamp that was inked up with the Craft White Stamp Pad and using a sponge dauber, picked up the Pretty in Pink from the Stampin' Pastels and dabbed it all over the the Floral stamp. Using a dry cotton pad, I wiped off the excess chalk. 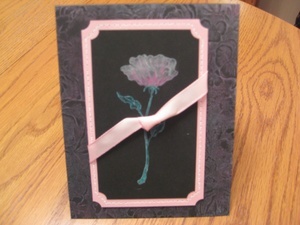 On the flower image, I inked it up with the Craft White Stamp Pad and stamped on the Black panel. With the pigment ink it takes a while to dry but I did start colouring on the image before it was completely dry using the Watercolour Pencils and highlighting it also with some pastels. You can pick up the pastel using the cosmetic q-tips for the finer lines and images. Finished off the card with faux stitching on the Pretty in Pink mat, clipped the corners with the Ticket Corner Punch and placed the Pretty in Pink Taffeta ribbon over the stem. It gives such a soft tone to the flower. The flower came out exactly as I envisioned. Often times I picture the way I would like my card to come out but it doesn't always turn out but the colours in this flower came out perfectly! With my second card I was inspired with a flyer that came in this morning's newspaper that had brilliant reds, browns, and deep yellow so I thought of using the Polished Stone technique as the basis of the card. Using the Rose Red, Chocolate Chip and Summer Sun reinkers, I soaked a cotton ball with rubbing alcohol and dabbed these colours onto Glossy White cardstock and completed the colours using the Metallic Gold reinker. As I hadn't used this reinker for some time, I found that it was very thick so I popped off the tip of the bottle and added a bit of water and stirred it up with a stir stick. It is water based so the little bit of water thinned it out and made it nice and easy to work with. I find that I am now into using the Creamy Caramel cardstock, one that I often wanted to use and would bring out to match with the card that I'm working on only to put it back into the file because it didn't seem to work with the colours that I was using. But I've used it twice in the last couple of weeks and am pleased with the colour combinations. I then cut an oval in the polished stone and Creamy Caramel pieces with the Coluzzle cutting System. After stamping the flower on Vanilla, I used the Watercolour Wonder Crayons and Aqua Painter to paint the rose - then finished off the card with a bit of light sponging around the flower. Am often asked how do you get your ideas - I find that I live in a Stampin' Up! colour world as everything I see is interpreted by Mellow Moss, Blush Blossom etc. etc. When we were in Vegas and I was in the "Dolls" of the New York New York casino, I looked at the tile on the floor and the colours that came to mind were Always Artichoke, Blush Blossom and Sahara Sand! Good grief - can't get away from Stampin' Up! even when on vacation. Have to try that colour combination on a project.